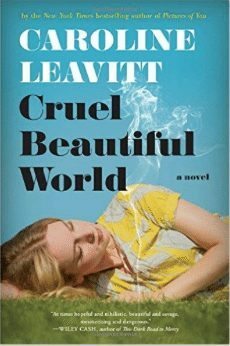 This month we’re reading Caroline Leavitt’s Cruel Beautiful World, one of the best received books of 2016. This book, about two sisters in the turbulent late-1960s, is about how family ties are formed and broken. While it covers big topics such as loss, grief, and domestic abuse, it’s also very readable and a popular choice for book clubs this year. It recently won The Pulpwood Queens Book of the Year. I had a chance to interview the author, who also wanted to give us more of a book club experience, recorded a video explaining some of her own backstory and why she felt the need to write this book. Q. Many of the themes in this book seem timeless. What drove your decision to set this book in the late 1960s? Caroline: Great question. I think because of that line between 1969–when everything that was innocent (like Lucy) and full of hope and promise–and soured into the 70s. The country was so divided. Also, because I had lived through the late 60s and 70s and it was so much fun to research and to write about. Love’s Baby soft anyone? Q. I wrote an earlier post about how Cruel Beautiful World is as imbued with wisdom as a good self-help book. When writing, do you start with certain messages you want to give the reader? Caroline: Oh, what a great question! I love it! Initially, I write to answer questions I have for myself, to help myself—and I hope then it becomes universal. I was thinking about love and kindness and how it works in the world. And I was having difficulty with someone whom I was trying desperately to make happy. I tried to help, but I made things much worse for her, and I had to realize that sometimes, no matter how much you want to, you cannot change people. You cannot fix things. You have to let life wash over you and just see what happens. That was a big revelation for me. I’m still grappling with that! Q. When you were writing this book, did any of the characters surprise you? Caroline: All of them did. Especially Iris. When I started writing her, she was sort of prickly, and as soon as I wrote about her first marriage, I knew who she was, and I admired her. Q. You write about finding hope in seemingly hopeless situations, and love after loss. Is this your view of the world? Did that influence the title? Caroline: Yep. It’s my view of the world. I’ve had terrible tragedies in my life. My first husband vanished and then kicked me out of the house. My fiancé died in my arms two weeks before our wedding. After the birth of my first son, I became critically ill with a mysterious blood disorder and was not expected to live. But I learned to fight, to be positive, to never, ever give up. And I found, too, that after great pain, you experience even greater joy. You appreciate it more. I’m always grateful for everything no matter what. The title came from my 20-year-old son, Max! He mentioned I might like this song, Cruel and Beautiful World and as soon as he said that, I thought, Oh my God! That expresses my world view! Q. How did the process of writing this book change you or your views? Caroline: I have always been a Pollyanna, and I’ve always tried to fix things—and people, just like Charlotte. But in writing her character and in my own situations, I discovered that trying to fix people made things much worse for them—and for me. So I (like Charlotte) had to learn to step back and give up control. Q. This book has been wildly successful. Why do you think it’s resonating with readers? Caroline: I wish I knew how to answer that! I think part of it is because the 60s were such a time of hope. We all really thought that we were going to change the world, that we could have peace and equality through peaceful protest. And then the 70s happened. Two girls in my college got guns and robbed a bank “for the revolution” and were on the FBI Most Wanted List for Years. There were the Manson murders. Kent State shootings of students. I think the political climate now is a mix of that—people wanting change and a really divided country—the way it was back then. I think part of it is also that the novel is about love and what is more compelling than that? It’s about first love, dangerous love and last love. Join us next month when we discuss Abby Fabiaschi’s I Liked My Life. The book is released on January 31 and has already received wonderful reviews. We’ll meet back here on March 14 to discuss the book and chat with the author.